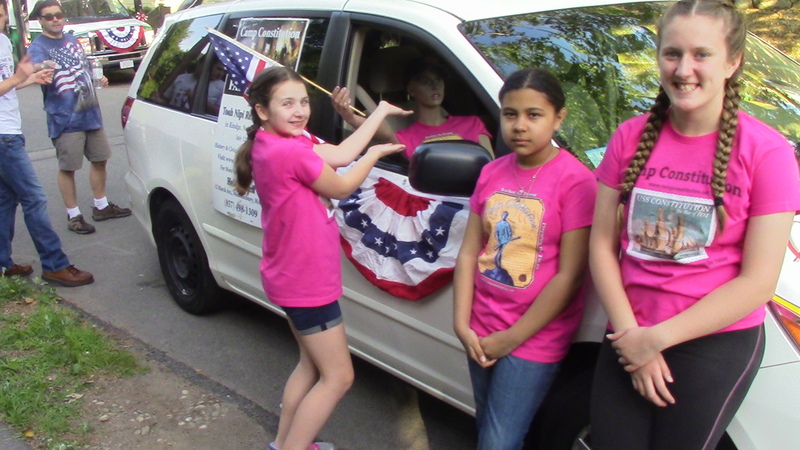 Camp Constitution had a float at the Dedham, MA Annual Flag Day Parade Sunday evening June 14. We had campers and staff from Camp Constitution hand out over 500 copies of the U.S. Constitution, 800 Camp Constitution pamphlets, and about 6 bags of candy. We were well received by the attendees young and old alike who appreciated getting the Constitutions and candy. Along the route, we asked one question to those receiving the Constitutions: What are the first 10 Amendments called? Sadly, only a handful knew the right answer. This is why our mission is so vital, and this is why we need to start more summer camps, and more outreach events. Interested in being part of the solution? Contact us. Host a presentation on how to start a camp in your area.